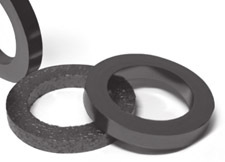 Starfoil (natural pure graphite) with a wide range of service temperature is made into compression mold ring packing. Especially there is little creep relaxation and temperature loss. Suitable for high temperature and high pressure steam, hot water, gas, hot oil, hot hydrocarbon, organic solvents,cryogenic fluids, LNG, valves, pumps, etc.